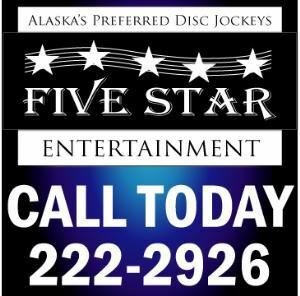 Five Star Entertainment is located in Anchorage and has Dj's that are well-trained! All of us attend regular weekend training seminars where we discuss new music, new trends and most importantly, experience. Our company is proud of our 50 years plus combined experience. What does that mean to you? It means peace of mind! You can also be assured every Five Star DJ will be interactive and take requests! Our promise is to work as professionals before and during your event. We will remember it’s YOUR event, ask you about the details, bring the right equipment, play the right music and make sure your event is one everyone will remember with great memories! This we promise with literally a 99% approval rate! Five Star Entertainment has completely modern and professional sound systems. From the computers and CD players to the speakers, everything is in tip-top shape! We know every time we go to an event, care and quality means our equipment will be dependable when we need it! We’re also expanding and adding equipment every month to make sure you have everything you could possibly need! Upgrades to your DJ contract may include a projector and screen, karaoke, disco lighting and our most popular addition ambient LED lighting with custom colors for your event! Dramatically enhance and customize any room with your theme colors! Give us a call today and get a free quote for your event! R&R Productions is one of Alaska’s top professional DJ entertainment companies, state-of-the-art lighting specialists and event photographers. We create personal and unique events, intelligent lighting displays, and carry one of the largest libraries of music in the state. All our equipment is top-of-the-line delivering excellence you can count on and a reputation you can trust. We Love what we do… and it Shows! **Please contact us directly by phone to further discuss your upcoming event.